Mike Cane turned up another pair of hands on videos over the weekend. They're definitely worth viewing - the second one in particular. For those who are just tuning in, these videos show a new ebook reader with a new screen tech. 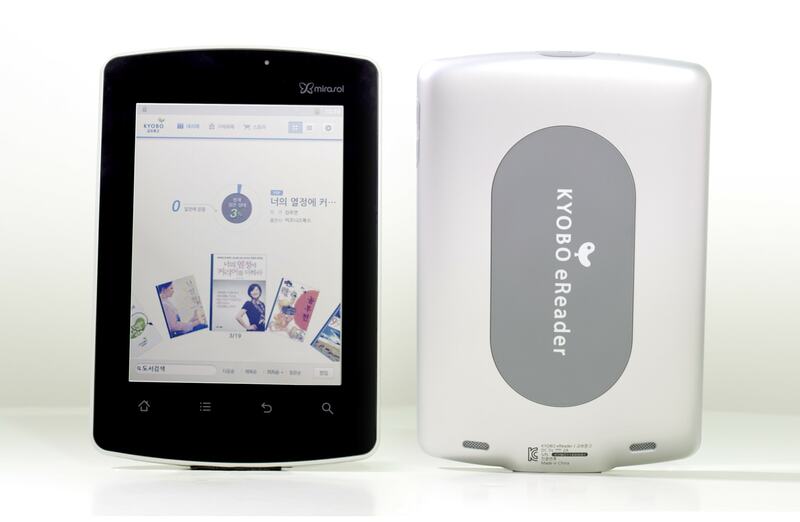 The Kyobo eReader is being sold in South Korea by Kyobo, a bookstore chain with 10 stores in 7 cities. Click here for more details. The video I posted a few days ago showed the new Kyobo eReader as a zippy tablet. The following 2 videos were shot by someone not familiar with the tech so you'll get to see a lot of first-time user mistakes. But you'll also see that some of the ebooks he tries to load take 10 to 15 seconds to open. That's slow, by any current standard. It's also not something we saw in the last video. I don't think that user ever left the ebook that was already open. Love reading about Mirasol updates. Thanks for sharing. Kyobo is close to Kobo so no wonder it’s slow. LOL! I would suspect some of the slowness comes from being Android 2.3 on a single core processor. I’ve seen a couple Gingerbread tablets running on single core CPUs. I wouldn’t say that they’re slow – not like this. I think those videos were being downloaded from the online bookstore, not just opened from the device memory. That’s why it took so long. I would like to see video with various backlight levels. From the second video it is obvious that there *is* some level of backlight switched on. I would also like to see comparison with Kindle4 and standard backlit notebook/tablet in carious lightning conditions. There’s no backlight, it’s a frontlight. OK. How smart is to put Book Readers with empty memory which will stream all labels from the network and this will take 10-15 sec in order to represent how good they are ? Well this is stupid and make a bad impression. Qualcomm may be You do not suppouse that this videos will be all over the internet – represnting your new device in front of all potential Customers? I desperately want one and emailed to the kyobo bookstore. But they did not reply yet. I could pay in advanc via paypal and i think south korea is not a white spot on the international banking maps.